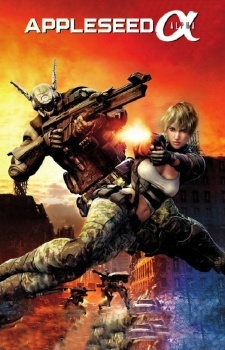 Appleseed Alpha depicts the early days of Deunan Knute and Briareos in the 22nd century, as they embark on a journey throughout dystopic ruins of New York in search of the city of Olympus. They are hired by Two Horns, the warlord of the ruined city, to eliminate bipedal combat machines. During the fight, they encouter Iris and Olson, both on a mission. Deunan and Briareos befriend with them and decide to join their mission.